Recently, police in British Columbia pulled over a man who was not speeding, not exhibiting signs of intoxication, and obeying all traffic laws. Why was he formally escorted to the shoulder? 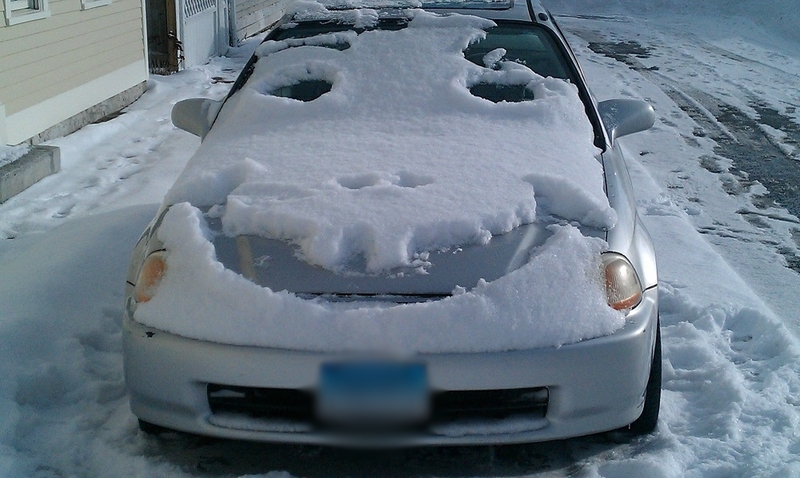 His entire car—save a small tea-cup-sized circle on his windshield—was completely covered in ice and snow. If you’re looking at a picture, it’s a little funny. If you’re driving next to him, it’s not. Winter poses all sorts of dangers (and apparently brings out the reckless drivers). Below are a few winter do’s and don’ts to keep you—and everyone around you—safe this season. Don’t drive frustrated or fatigued. Sure, the holidays are warm and bright, but that doesn’t always cut out the stress, nor does it give you back those hours of sleep you spent shopping or wassailing. If you’re tired or feeling the push from holiday pressure, wait to drive or call a ride. Don’t start your car in a closed garage. This leads to monoxide poisoning, which leads to death. Please don’t think this is too obvious to mention. Many people who “just want to get the car warm for a few minutes” before venturing into the winter holocaust never venture anywhere again. It’s tragic, but completely avoidable. First, open your garage door, then back out. 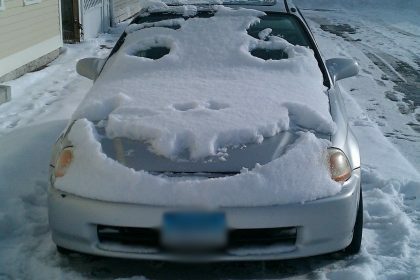 This alone will warm up your car! Don’t stop if you don’t need to. Remember that guy who said, “an object in motion tends to stay in motion”? Who was that—Isaac Newton? Fig Newton? Whoever he was, he said it right, and it comes back to us from high school physics class in all too real a way on winter roads. Never stop on a hill, and try to brake at lights in enough time to keep your car moving slightly forward until the light changes. This is because it is difficult to get a car rolling again on slick winter roads, and this can cause accidents and pile-ups since people will then have to brake quickly (risking spin out in icy conditions) to avoid you as you try to get the car moving again. Don’t accelerate and decelerate quickly. Sudden starts and stops will cause handling problems, especially in ice and snow, as you know. Maintain a consistent speed for best traction. Don’t use cruise control. While we do recommend maintaining consistent speed, icy roads are no place to use cruise control because they remove your ability to respond to hazardous road conditions. When you slide on ice, your car will carry its speed into and out of your slide, and that could spell d-i-s-a-s-t-e-r. Enough of the negative. We get that there’s a lot of stuff you shouldn’t do, but what about the stuff you should? Here are some winter do’s. Do keep de-icer or an ice scraper in your car, along with an emergency medical kit, warm clothes (hat, gloves, jacket), a blanket, a charged cell phone, and charger. Do keep your gas tank at least half filled. If you’re stuck in the ice, you will need gas to get unstuck and to run your heater until help comes! Do winterize your car before winter weather hits, and get your car inspected to determine needed repairs and replacements. Make sure your tires are dressed for the season! Do count your blessings daily. This will combat the stress, fatigue, and chill of those long, dark winter drives! Now, get out there and make some holiday memories with family and friends with confidence that you can keep them safe on the drive!